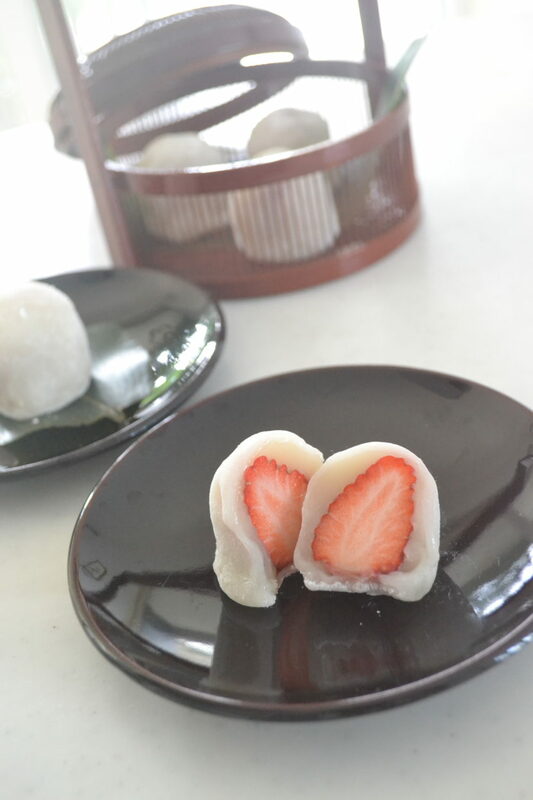 Today, I will show you how to make “Ichigo Daifuku,” strawberry daifuku mochi. 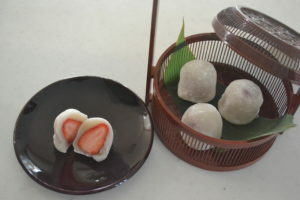 Ichigo Daifuku is consist of sweet mochi rice cake and strawberry. It is very popular in Japan when strawberries are in season. Strawberry is sweet and tangy; mochi is soft and silky; these are the perfect combinations! When you give it a bite, you will be surprised at the taste and texture. Wash and clean the strawberries. Remove the moisture and cut off the stem. Next, divide white bean　paste into eight equal portions. 2. Shape white bean paste into a cylinder, mark a center, and mark a center of left half and right half, then cut each section into two. 3. Wrap strawberries with white bean paste like. Set aside. ※In Kansai region, where I live, tend to use white bean paste. In another region, they use red bean paste. Of course, you can use red bean paste. It can’t go wrong. 4. Dust a tray with cornstarch. And set aside. In Japan, there is a starch specifically use for mochi called “Mochitoriko.” Use it if you find it. 5. Put mochi-ko, sugar and a pinch of salt into a bowl and mix with a whisk to combine. Add a third of water, and mix. Make sure no lumps. Add the rest of water in two to three part and whisk well. Pass the batter through a sieve into a non-stick frying pan. 6. Turn on the heat to medium-high. Stirring constantly until partly cooked. When it fully cooked, stir vigorously until the mochi dough become sticky and shiny for one to two more minutes. 7. Transfer the mochi dough to a dusted tray. Fold in half and shape into a log. Mark the center, mark the center of left and right like we did to divide the white bean paste, cut into eight equal portions. 8. Take one mochi on your palm and put a white bean wrapped strawberry on it. Wrap it with mochi like this. The mochi is very sticky and elastic. Dust your palm and fingers with cornstarch as much as you need. But not too much, otherwise it will taste starchy. 9. Pinch off　the excess dough and shape nicely while rotating on your palm. Voila! This is how it shape the strawberry daifuku. So adorable, isn’t it? It is a truly messy job but worth trying! Keep in mind that practice makes perfect! When you finish wrapping, Transfer to a serving dish. You can store in your fridge until the next day. I like to serve with green tea. Taste so good. Sweet mochi and white bean paste go so well with the freshness of strawberry. Ichigo Daifuku is a relatively new kind of Japanese sweets. I clearly remember when it in the market. When I gave it a bite, I fell in love with it. I’m sure you will love it too! So, give it a try!